Register Log In GliderCENTRAL Forums Health & Hygiene Emergency?? Hope I'm wrong and this isn't an emergency, but Dalton is having hiccup/spasms and I'm in St. Louis without a vet. When my dog did something similar, the vet called it a 'backwards sneeze' and told me not to worry about it. Yeah. I'm worried. It gets severe and constant then milder and not constant. We hit the road on Wednesday-1350 miles til we reach his vet, so I want to know if it's serious so, if necessary, we can stay in St. Louis and find a vet. Hope someone's got the answer. Last edited by alice33; 12/25/17 11:55 PM. Hi Alice33. Can you describe the symptoms? When you say hiccups/spasms, what exactly do you mean? Is he jerking? Is he sneezing? Is he convulsing? You say without a vet...if you're in St. Louis, I suspect there are several emergency vets in that area that would be able to help. If this is new behavior that you haven't seen before, then it's something you likely want to get checked out. If you can post a video of what's happening, that would be helpful. Wouldn't call it 'convulsing' but yes, his chest moves and he makes a noise like a quick inhale. Still loving mealworms but not as social as usual. He's done it before. Hoping it's not stress. His mother died about a month ago and we drove 1400 miles (10 days ago). The cage smells like him and his mom. Haven't lived in St. Louis since 2004. 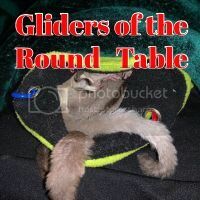 Before that, fired my St. Louis vet who knew gliders but didn't feel like he had to show up, even when we had surgery scheduled. Any significant change in behavior warrants a vet visit. You have to be the judge of whether or not you feel this is a situation for an emergency visit. If he's in distress, then obviously. But, since we can't see or hear what he's doing, and since you know your glider, you'll have to make the determination as to whether or not you feel he needs to be seen sooner rather than later. If his behavior gets worse, then you know what you need to do. If he remains unchanged, I would definitely call and schedule a visit with your regular vet for when you return home. I will be moving this to Health & Hygiene, please keep us updated on your little guy. Hoping you can find a vet and get an idea of what's going on there. Also hoping for a good-news update! Thanks to all who offered support and suggestions. Just got back from the vet. X-ray showed no sign of pneumonia. vet thought it was either a touch of bronchitis or allergies. Enrofloxacin every 12 hours plus children's strength Robitussin.